I saw this recipe on the blog Love and Lemons and was verrrry intrigued by it, so I decided to add a couple of things to it and try it out! I must say – I wasn’t disappointed in the least. In fact, it’s almost midnight and I’m tempted to get up and make this RIGHT NOW. This was such a great, refreshing, simple snack and could also be a great appetizer. She did a little different from me and I think she probably made it more savory, so make sure to check out the original recipe. I think I might have to try out the original myself tomorrow! This can be lunch, an app, dessert, a snack… so many things! Simple, easy and delicious!! Toast the bread. Slice your avocado in half and then spread it onto the bread. While the bread is toasting, slice your strawberries. (option to drizzle with balsamic and let sit for a few minutes as well). 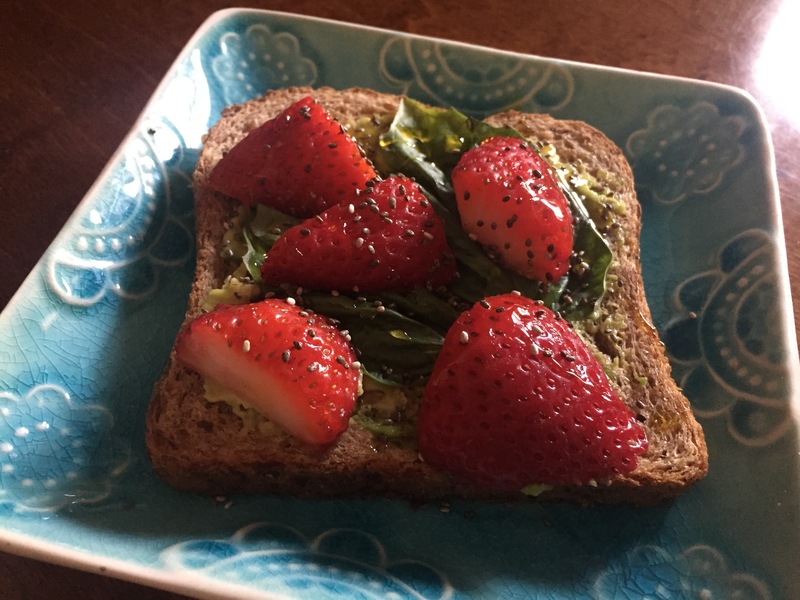 Top toasts with basil, strawberries, a sprinkle of chia seeds and a drizzle of honey or maple syrup. Oooo nice! I made strawberry basil bruschetta once and it was awesome. Its such an unexpectedly amazing combo! YES!! It’s so very good!! Such a great pairing!